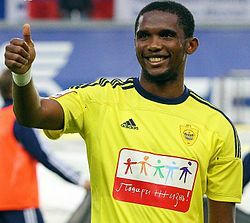 1 – Samuel Eto’o, Anzhi: 20.5 million. Samuel Eto’o Fils (Nkongsamba, March 10, 1981) is a Cameroonian footballer striker of Anži team and of the Cameroonian National. The Futbol’nyj Klub, also known as Anži or Machačkala Anži, is a football club of Machačkala, the capital of Dagestan in Russia. Considered one of the strongest players in the world, is the only player to have achieved the prestigious treble twice in succession, however, having won the league, national league and Champions League with Barcelona in the 2008-2009 season, and with Inter team in 2009-2010 season. 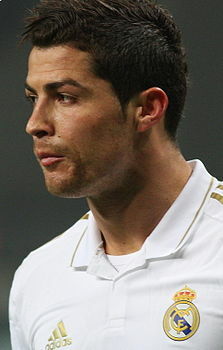 The employment of 20.5 million euros per season given from Anži, made him the highest-paid player in football history. 2 – Cristiano Ronaldo, Real Madrid 12 million. Cristiano Ronaldo dos Santos Aveiro (Funchal, February 5, 1985) is a Portuguese footballer, striker of Real Madrid and the Portuguese National. His transfer from Manchester United to Real Madrid in the summer of 2009 for 94 million euros recorded a record in the history of the transfers. 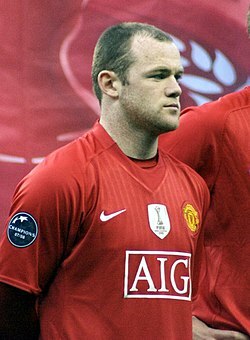 3 – Wayne Rooney, Manchester United: 11.5 million. Wayne Mark Rooney (Liverpool, 24 October 1985) is an English footballer, striker of Manchester United and England national. Currently Wayne is also the highest paid English footballer in the world, the third overall. Earn, in fact, 11.5 million euros a year. 4 – Lionel Messi, Barcelona: 11 million. Lionel Andrés Messi, also known by the diminutive Leo (Rosario, June 24, 1987), is an Argentine footballer, striker of Barcelona and Argentina, where he is the captain. It is the only player to have scored five goals in a Champions League match. 5 – Yaya Toure, Manchester City: 10.8 million. Gnegneri Yaya Toure (Bouaké, May 13, 1983) is an Ivorian football player, midfielder or defender for Manchester City and the National Ivorian. On July 2, 2010 signed a five year contract for more than 10 million euros per year with Manchester City, who acquired him from Barcelona for 30 million euros. In English club he finds his brother Kolo. 6 – Bastian Schweinsteiger, Bayern Monaco: 9.7 million. Bastian Schweinsteiger (Kolbermoor, 1 August 1984) is a German footballer midfielder for Bayern Monaco and the German national team. The year 2009-2010 is the year full of success: in addition to fifth win in the Bundesliga with Bayern Monaco also won the national cup and reaches the Champions League final in Madrid, where the German team was defeated by Italian Inter. 7 – Zlatan Ibrahimovic, Milan: 9 million. Zlatan Ibrahimovic (Malmö, October 3, 1981) is a Swedish football striker of AC Milan and the Swedish National. When as a militant for Inter team, with an overlap of 12 million euros per season, was one of the highest paid footballers in the world. July 27, 2008 Ibrahimović signed a five year contract with Barcelona, which pays 50 million euros to Inter, giving Samuel Eto’o, valued 20 million. On August 28, 2010 Ibrahimović is transferred to AC Milan on loan with the right of redemption set at 24 million exercisable at the end of the season. 8 – Ricardo Kaka, Real Madrid: 9 million. Ricardo Izecson dos Santos Leite, better known as Kaká (Brasilia, April 22, 1982), is a Brazilian football midfielder of Real Madrid and the Brazilian national team. Since 2007, thanks to the Italian roots of the wife is also an Italian citizen. In the summer of 2003 he was bought by AC Milan for 8.5 million euros. In June of 2009 is officially announced the purchase of Kaka by Real Madrid for 67.2 million euros. The Brazilian player has signed a contract that will tie him for 6 years at the Spanish club.